Remembering my career 5 years ago, I was an Accounting Manager. But before that, I was in charge for various position in the accounting and financial field. Started as a bookkeeper, financial analyst, auditor, accounting manager, tax consultant, and controller. Now I’ve been thinking about what will my next-5 years career path will be? Be CFO? ;Or Finance Vice President? I started exploring and analyzing my career path from the past, currently and the possibility in the next 5 years. 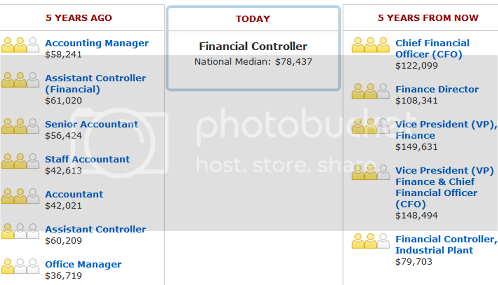 Ended up at payscale.com where I found a career path explorer tool called “GIGZIG ™”. A cool and simple career path explorer, it is able to predict your position five years from now its median salary for each position that match. Here are accountant career path I have explored using the tools. I hope it inspires you. Enjoy!